The Duquesne University Graduate School of Pharmaceutical Sciences and the University of Pittsburgh sponsored the American Association of Pharmaceutical Scientists (AAPS) Student Research Symposium on Tuesday, November 5, in Duquesne University's Power Center Ballroom. 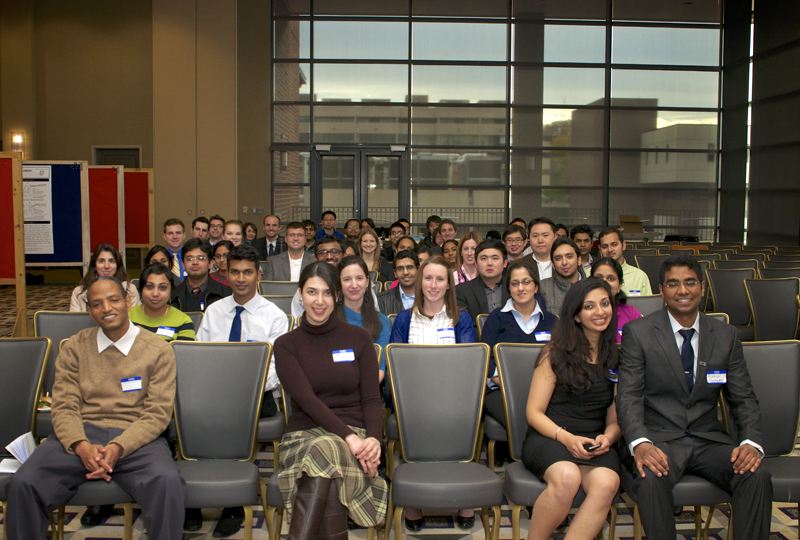 There were 105 attendees at this year's event, including undergraduate researchers, graduate students, fellows and post-docs associated with the Duquesne, University of Pittsburgh, and West Virginia University Schools of Pharmacy. Each year, the symposium provides a forum for personal and professional development for graduate students, professional students, residents, fellows, and faculty members doing pharmaceutical and clinical research in Pittsburgh and Morgantown. Attendees are provided with an opportunity to exchange scientific ideas and present current research as a learning opportunity, and to promote future research collaborations within departments and across universities. In addition, graduate and professional students have the opportunity to receive monetary prizes for outstanding work. Posters were displayed and presented in two sessions. Half of the students were required to be at their posters to field questions for the first session, while the other half was allowed to browse through the remaining posters. The groups switched for the second session. A panel of faculty judges from both Duquesne University and the University of Pittsburgh selected the top three posters and top two podia presenters, who received monetary prizes. The podia winners for the event were: 1st place- Brandon Lucke-Wold (West Virginia University), and 2nd place- Yie Wen (Duquesne University). The poster winners were: 1st place- Dhruv Shah (Duquesne University), 2nd Amanda Gleixner (Duquesne University), and 3rd place- Michael Shimko (West Virginia University). According to the AAPS-Duquesne chapter chair Rahul Roopwani, "The event provides each AAPS student chapter the ability to advertise its benefits to other post-doctorate, graduate, undergraduate or professional students who are unfamiliar with the AAPS student chapter mission. The event also provides a platform for graduate school recruitment into the pharmaceutical sciences. The event aims at fostering professional interaction between students and faculty in Western Pennsylvania and providing students the opportunity for future research endeavors and to facilitate potential research collaboration between laboratories where research is complimentary."